Pool Industry Associates joined Paragon Pools in promoting water safety through a partnership with the long-running Float Like A Duck™ campaign; Educating the public on the importance of safety while celebrating the joys of water sports. LAS VEGAS - May 11, 2016 - PRLog -- Pool Industry Associates Zodiac Pool Products, Cover Pools and Carecraft joined Paragon Pools in promoting water safety through a partnership with the long-running Float Like A Duck™ campaign; Educating the public on the importance of safety while celebrating the joys of water sports. Nationally recognized water safety advocate and president of Paragon Pools, Joseph M. Vassallo, CBP APSP Fellow states, "Water and water sports are an integral part of our lives whether it be in the bath, a pool, at the lake or beach. Our goal through the Float Like A Duck program is to prepare the entire family with water safety skills, practices and preventative measures to ensure every experience is an enjoyable one." The 13th Annual Float Like A Duck™ is scheduled for Saturday, May 28, 2016 from 12 noon - 4 pm at the Heinrich YMCA Water Sports Park in Las Vegas, NV. The event is FREE, open to the public and features exhibits, hands-on activities, learn-to-float classes, and open swimming in the water park. "We are pleased to lend our support to the Float Like A Duck water safety campaign," states Scott Ferguson, Zodiac Pool Systems Director of Strategic Accounts. "Our focus at Zodiac, Jandy and Cover Pools is developing swimming pool technology and products that lead to a safer, more efficient and enjoyable aquatic environment." "Gaining support from industry partners allows our program to further our reach in the community and beyond," notes Vassallo. "This year we are able to double the size of the official Float Like A Duck™ water safety coloring book to a total of 20 pages and print 2,500 copies for distribution at the events, the health district, schools, libraries and hospitals. Zodiac, Cover Pools and Carecraft join the following organizations in supporting the water safety event: the YMCA, KVVU-Fox-5, Las Vegas Metro, Mascot McGruff, Las Vegas Fire & Rescue, Danny Romero Designs, KTNV-TV13, the APSP, UMC Children's Hospital, Nevada Highway Patrol, LV Metro Volunteer Police, Pictographics, Hearts Alive Village Las Vegas, MAC Landscaping, the City of Las Vegas, the SNCDPC, Clark County, the SNHD, and Beasley Broadcasting Group. 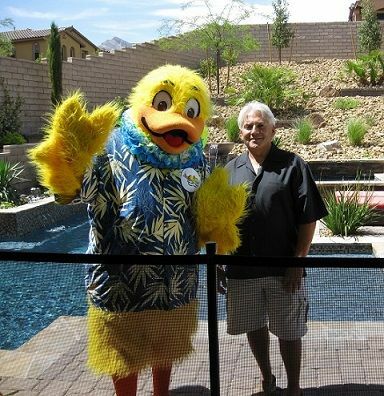 FMI go to http://www.paragonpoolslv.com/float-like-a-duck and follow Duckie at http://www.facebook.com/Floatlikeaduck .